1 Canada was a colony at first. That meant another country made the laws. At first, it was a French colony. Then France and England had a war. The English won. The land we call Canada became England's. 2 Over the years, the colony grew. Some people spoke English. Some of the people spoke French. The colony was split. The western part where people mostly spoke English became Upper Canada. It was the lands bordering Georgian Bay and Lake Superior and the southern part of what is now the Province of Ontario. To its east, the other part where people mostly spoke French became Lower Canada. It included part of what is now the Province of Quebec and Labrador. 3 This made the people happy for a while. Before long, they began to be unhappy again. This time it was with the government. Some people thought the laws were unfair. They wanted things changed. They wanted reform. 4 Finally, things were changed. Upper and Lower Canada were joined into one colony. 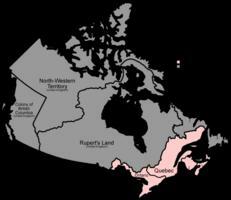 They became the United Province of Canada. There were colonies called New Brunswick, Nova Scotia, Prince Edward Island, British Columbia, Newfoundland, too.